Available in Natural & Dark Walnut Traditional finish. Size: 42″x24″x72″ (front length / end to end x Depth / front to back x Heigth) in inches approx. Large enough to have all your pooja essentials at one place. Can be customized as per your home. 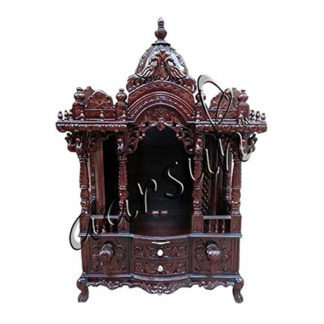 Aarsun Home Temple is made with fine quality teak wood and carefully handcrafted by skilled artisans. A home temple or a prayer unit plays a major role in our house by instilling our homes with positive vibes. This specific home temple has 3 major parts. Base: The base contains 2 drawers for pooja essentials. Slider / pull out tray is provided for placing Dhoop / Diya adjacent to which are two Cabinets with Beautiful Elephant Heads carved in front. The whole Temple is supported by 4 legs. The unit is in antique dark walnut matte finish. The unit is a fixed Home Temple. Please note that the Home Temple is made from teak wood (Sagwan Wood) except for the Base where idols are to be kept, the back, the top as well as the inner portion of the drawers which is made from teak plywood. Moisture Resistance: Home Temple made in Sagwan Wood has a good resistance to moisture and water. Termite Resistance: Sagwan wood has a natural oil content that resists termites (white ants), fungal stains, and also repels other insects that can destroy the wood which make the Home Temple termite resistant naturally. High Dimensional Stability: Sagwan wood does not warp or shrink as compared to other wood materials thereby making the Home Temple free from any distortions or shrinkage over time. You can use a good quality thick cotton cloth in order to rub the dust and retain the natural lustre of the Temple. Custom Sizes Available as per customer requirement. Have a look at the different type of home temple perfectly crafted for your home. Aarsun woods provides a wide range of home temple that can complement both the modern and ethnic decor of your home.